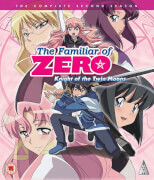 All 12 episodes from the third series of the Japanese anime featuring the voice talents of Rie Kugimiya and Satoshi Hino. The story follows Louise (Kugimiya), a young girl who tries but fails to perform successful magic. Nicknamed 'Zero Louise' by children at her school, she is forced by her peers to use a special ritual to summon a familiar, an eternal protector and partner in the world of magic. In this series, Louise and Saito (Hino) have made the ultimate commitment to each other by getting married. However, when the bond that connected them as master and familiar is lost Louise worries that Saito will leave her. The episodes are: 'The Familiar's Mark', 'The Elf of the Forest', 'The Return of the Hero', 'The Rumoured Accepted Student', 'The Alluring Women's Bath', 'Forbidden Magic Drug', 'Slepnir Ball', 'The Eastern Pursuit! ', 'Tabitha's Younger Sister', 'Border Mountain Pass', 'Captive in Al Hambra' and 'Wings of Freedom'.